File this one under "get it while you can". 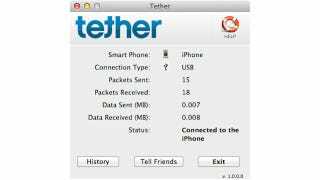 An app that provides free USB tethering between your iPhone and your laptop has somehow made its way through Apple's approval process and snuck into the App Store. Cue feeding frenzy. Update: Not-so-shockingly, iTether just got pulled from the App Store. Historically, if you got an app before it was yanked then congratulations, it's yours to use and enjoy, and we expect it will be the same story here. We'll see if we can confirm, though.